I don't mean to brag here, so please forgive the slight conceitedness that may emit from what I'm about to say. But I've always had fairly good skin. We're talking minimal breakouts and dryness, pretty normal-sized pores, the works. But I've definitely noticed a decline in the goodness since living in New York. The pores on my nose are clogged, I break out more frequently, and my cheeks and forehead are noticeably dry in the winter. But now I'm pretty sure I'll be able to get my face back on track -- and it's all thanks to DDF Blemish Foaming Cleanser. I was immediately intrigued by the bright turquoise hue of the cleanser and the fact that it foams as it's pumped out of the bottle -- which definitely made washing my face every night a lot more enjoyable! I've been dutifully using this product for the last week and a half, and I can honestly say it's saved my skin. The pores on my nose -- which are normally so clogged it looks like I have freckles -- are noticeably cleaner and smaller, which seriously makes me thrilled. And blemishes that had popped up are decreasing in size and color a lot quicker than usual! This is due to calming ingredients like myrrh, echinacea and calendula, and of course the 1% of salicylic acid doesn't hurt! Plus it's non-drying and non-irritating, so my skin literally glows as the cleanser is rinsed off. 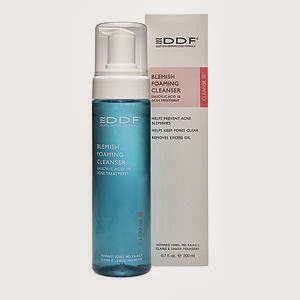 DDF Blemish Foaming Cleanser retails for $39 at beauty.com.